High Productivity Digital Printing Machines. Piezo electric on demand print head. 90 nozzles each color (6 colors). Prints A3+, A4, A5, A6, B5, letter, legal etc. 6 color inks cyan, magenta, yellow, black, light magenta, light cyan. 1.5 pl ultra micro dots. Resolution 5760 x 1440 optimized DPI using RPM technology. M/C Dimensions - L 13" W 24" H 12"
Adopt environmental LED UV Solidification technology to increase the useful life, and low energy consumption. 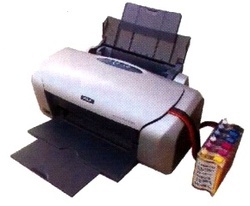 The printer can accept more printing media to meet much more customer's demands. 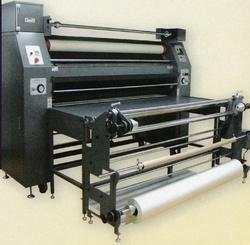 Industrial stable printer body to increase useful life and adopt roll to roll stable feeding system. Six color printing with more exquisite color transition. Also accept grey print head with double resolution mode to meet more requirements. Adopt water based industrial print head to increase the useful life, and low cost. Industrial stable printer body to increase useful life and adopt constant tension structure and roll to roll stable feeding system. Color developer and air cleaning device together with the printer to against pollution. Unique extension design for softer media smoothly feeding. Designed with extensive drying and double-fan drying system, so the picture drying more quickly and thoroughly. Adjustable heating system of front, middle, rear. High precision caused by integral machine frame. Imported brand motor, guarantee its even speed and stability when printing. Humanized feature with three kinds of feeding. Insert type of feeding, deposited mode by 2 rollers holding, deposited mode by 3 rollers dragging. 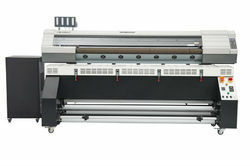 Adopts 4 pcs epson dx5 print head, which with 180x8 of nozzles, the quantity is four times than before. The design of a fully-sealed air draft structure and a mute air draft fan allows the printer to operate most quietly, enhancing the working environment for staffs. High-precision paper feeding system, to ensure paper moving stability and uniformly, improving paper feeding precision by over 30 percent and refining the pictures. In comparison with C-grade precision, the precision of THK rail guide increased by 30 percent, stable high-quality printing is realized. The multi-point pinch rollers guarantees the most accurate pressure on printing table for smooth paper feeding smoother and stable printing. Distinctive metal tablet designed for no wrinkle and stable printing. The print head cart consist of high-precision parts, to achieve print head height adjustment, damper fixture and easily head physical adjustment. 5th epson's newly developed high-speed head, contains 180 x 8 column nozzle, 4 times of conventional nozzles. The fully sealed suction structure and mute suction fan design, working noise to a negligible, improved the working environment of employees. High - precision mold making tray, guarantee the concentricity and uniformity of the sheet travel, paper feed accuracy more than 30% increased, pictures more delicate. The original THK level high precision mute rail, increased by 30% than C- level accuracy, achieve stable high quality printing. Using multi-point and pressure adaptive pressure wheel, the most accurate pressure control, running paper smoother, helps achieve a continous and stable printing. New mold paper presser design, slide freely, strong, stable, no tilting, ensure stable and continuous printing. Multiple high-precision mold carts, achieved stepless adjustment of the nozzle height, ink sac fix and simple nozzle physical adjustment. 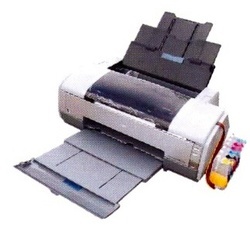 Adopts 4 pcs epson DX5 printhead, which with 180x8 of nozzles, the quantity is four times than before. The design of fully-sealed air draft structure and a mute air draft fan allows the printer to operate most quietly, enhancing the working environment for staffs. High - precision paper feeding system, to ensure paper moving stability and uniformly, improving paper feeding precision by over 30 percent and refining the pictures. In comparison with C-grade precision, the precision of THK rail guide increased by 30 percent, stable high quality printing is realized. The printhead cart consist of high-precision parts, to achieve printhead height adjustment, damper fixture and easily head physical adjustment. Prints A4, A5, A6, B5, letter, legal etc. M/C Dimensions - L 18.6" W 18" H 11.6"